If you haven’t noticed already, a lot of companies send out holiday greetings in December. I’ve gotten several emails and several cards from various companies and organizations over the past few days and I imagine it’ll continue right through the main part of the holiday season. Holiday cards are a nice gesture. I’m not sure how much business they’ll get your company, but the number of customers who will be annoyed by a nice holiday card is very small. They’ll help your brand and help to show customers that you are thinking about them. Some customers will really like the cards, while others will just look at it briefly and then throw it out. Some companies put promotional certificates or other such promotions in the holiday greetings they send out. These can be effective, but I also think “polluting” the card with promotional material can detract from the “we care so we are sending you a card” message. The choice is obviously yours and as long as you include your promotion subtly and within the context of a holiday greeting, you should be fine. 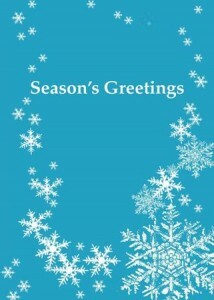 Holiday greetings should also be attractive and well designed. If you don’t have professional designers in-house, hire someone to come up with your cards or buy cards that are particularly stylish and fit in with your overall brand. Use a nice font, high quality card stock, well written text, and so on. If your brand is ultra-formal, don’t pick a playful design – be consistent. And remember to be politically correct with your cards. Happy holidays, season’s greetings, etc. are all nice things to put without having to associate yourself with a particular holiday and risk offending or alienating someone. Nice point. And you are absolutely right in saying that a promo within a greeting reduces the value of the greeting itself. We resolved the matter this way: first, we sent nicely designed paper cards to a number of our customers, and in a while, we emailed our users with a nice offer. « Does your IT department provide great service?